The Ocean Park Branch Library is located at the corner of Main Street and Ocean Park Blvd. By Freeway. Take the I-10 freeway to the 4th Street exit. Take 4th Street south for 0.3 miles and then turn right on Pico Blvd. Proceed 0.5 mile to Main Street, then turn left. The library will be on the left. By Bus.The Ocean Park Branch Library is served by the Big Blue Bus lines 1 and 8. Limited metered parking is available along Norman Place, Ocean Park Blvd and Main Street, as well as in the lot directly in front of the Branch’s Norman Place entrance. Additional metered parking is available in City Lot 11 with entrances located at 2934 Main Street and at 170 Hollister Avenue. Bike Racks. Cyclists can secure their bikes at the bike racks on Norman Place next to the parking meters. Additionally, there are artist-designed bike racks located behind the library on 2nd Street and in front of the library on Main Street. Ocean Park – Exterior Materials Returns – Two returns are located on Norman Place on the sidewalk near the Library entrance. These returns are available 24 hours a day, seven days a week, and accept books, magazines and audiovisual materials. Please do not drop donations into these returns. All donations should be brought to the Main Library, 601 Santa Monica Blvd. Children. The Ocean Park Branch offers storytimes and puppet shows, class visits and much more. Teens. Take advantage of our community volunteer opportunities (8th grade and up). Adults. Enjoy our Ocean Park Book Group which meets the first Saturday of the month. Community Room. A 60-person capacity meeting room is available for rent for meetings or programs that are free and open to the public. Computers. The Ocean Park Branch Library is equipped with 6 public access Internet stations. Photocopiers and printers. Black-and-white printing and photocopying, as well as color photocopying are available. The Ocean Park Branch Library represents one of the few Carnegie-endowed structures still functioning as a public library in Southern California. Built in 1917-18 on land donated by the Tegner family, the original building was designed by local architects Frank T. Kegley and H. Scott Gerity in the Classical Revival architectural style. 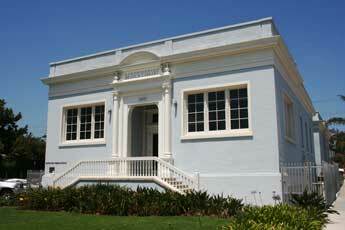 The Ocean Park Branch Library was declared a historic landmark by the City of Santa Monica Landmarks Commission in May 1977. In 1984 the architectural firm Mayer/Taylor was hired to design the addition, which currently houses the children's and teen sections and to add significant features for handicapped access. Mayor Christine E. Reed and the Santa Monica City Council hosted a reopening ceremony of the branch on October 14, 1985. In 2011, the Branch benefitted from an interior improvements project and new signage was erected outside of the library. The current building size is 8,434 square feet.